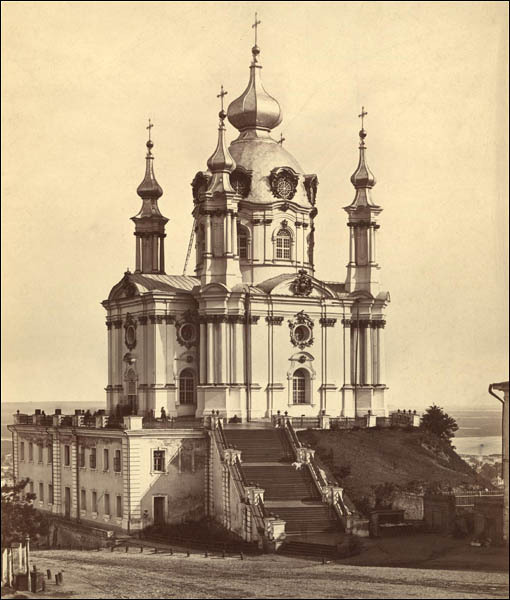 It is built in baroque style as a personal palace church of the Russian empress Elizabeth based on the project of V.Rastrelli by the architect I.Michurin. This is the smallest building of all the projects of Rastrelli. 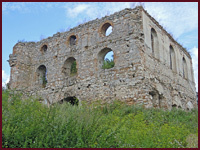 The depth of the church foundation is 15 meters, the height is 60 meters. 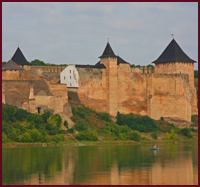 The adaptation of the project to the complicated relief of the hill was done by Michurin. 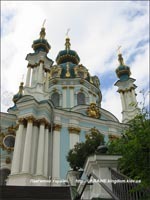 The church was built on the place where bastion of XVII century had been situated. 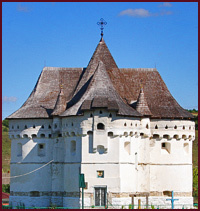 At first, Michurin built two-storied building which was standing on the ground only by its one side. 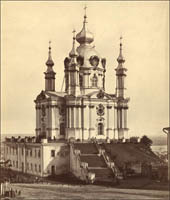 Later it became the basis of the upper church. According to Rastrelli project the entrance to the church was through the ramp – lop-sided area. Michurin proposed to build the stairs which, actually, made the building look even better. At first the stairs were wooden, but later were replaced by cast-iron ones. The church is decorated with the ornament designed by Rastrelli. 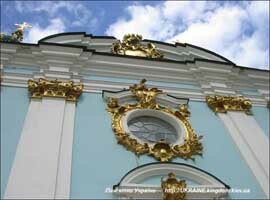 Ornamental works were done by Ukrainian craftsmen V.Kvitka, Y.Shevlyts’kyy, V.Kletskovs’kyy and also some Russian ones. Interior paintings were made by Vyshnyakov and Antropov. Famous Ukrainian painter and engraver H.Levyts’kyy also took part in this process. Wood carving was done by the craftsmen from St. Petersburg. Composite nature of the church, the refinement and the nobleness of the building are amazing. It has four small cupolas which are situated not in the basis of the main one but diagonally on sides which makes it quite original. 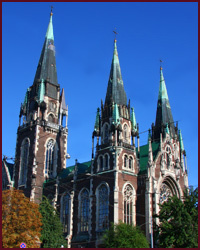 The buttresses in the corners are decorated with the ornamental tops. After the death of church’s founder, it fell into decay. In 1891 it was struck by lightning after which the restoration was done. The person who had done it was a real fraud with no necessary skills to do it. 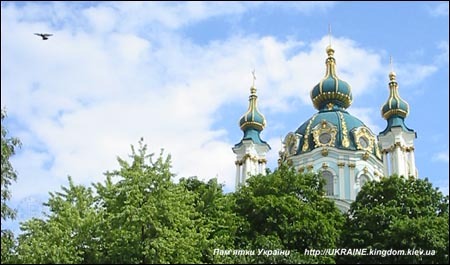 After the renovation the inhabitants of Kyiv were shocked to see the new dome which looked very awful. The general-governor opened the case following the process of restoration and the money spent on it. Special commission aimed to save the building of the church gathered and the restoration was entrusted to Volodymyr Nikolayev who was a real professional. He restored the dome only based on the photographs as there were no sketches of it available. The original sketches of Rastrelli were thought to be lost, but later they were found in Vienna, it happened in 1960-s. With the help of original sketches architect Korneyeva finished the cupola and it obtained its initial look in 1978. The interior of St. Andrew’s church is heavenly beautiful. When you enter the church, you get stunned with the beauty of triple-tier iconostasis which is a true masterpiece. It is made from mahogany decorated with the gilded carvings. You are not allowed to take pictures inside, but you can buy one in the church. Starting from 19.30 every weekend chamber concerts are held here, divine services take place from 10.00 till 13.00 and from 17.00 till 19.00. The history of the church’s origin is very interesting. In the ancient times on this place there were wooden churches having the common name of the Exaltation of the Cross. They didn’t exist for a long time due to different natural disasters like fires or strong wind. 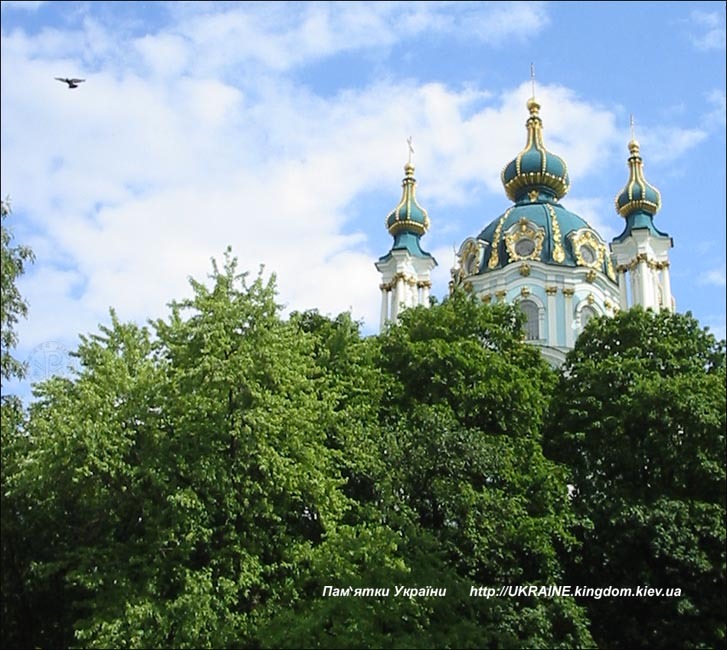 Legend tells that St. Andrew himself came to Kyiv and put a cross into the ground on the same place where the church is standing now – the sea disappeared and the ground appeared on its place. It is also said that with the first toll the sea will appear again and will flood Kyiv and the Left-bank. This is reason why St. Andrew’s church has no bells. The church was being renovated since I was a kid. Still I’m very thankful to my mom who took me there. The greatness of iconostasis as well as XIX century painting “Duke Volodymyr chooses the faith” made by the unknown artist are still engraved in my memory.